Credit card – Please visit your order page’s Billing tab to make a secure credit card payment. You may also call to make a credit card payment at (855) 467-2439 ext. 703. Mailed check – Please make the check payable to Science Exchange, Inc. and reference your order number in the note. Send the check to Science Exchange, Inc., at 555 Bryant St. #939, Palo Alto, CA 94301, USA. Domestic/ international wire transfer/ ACH – Please contact [email protected] for banking information. Please generate a PO for Science Exchange, Inc. at 555 Bryant St. #939, Palo Alto, CA 94301, USA. Make sure to include the 6-digit order number in the PO and in any supporting documents or correspondence. Email the PO to [email protected] Alternatively, mail it to Science Exchange, Inc. or fax it to 1 (650) 307-6867. 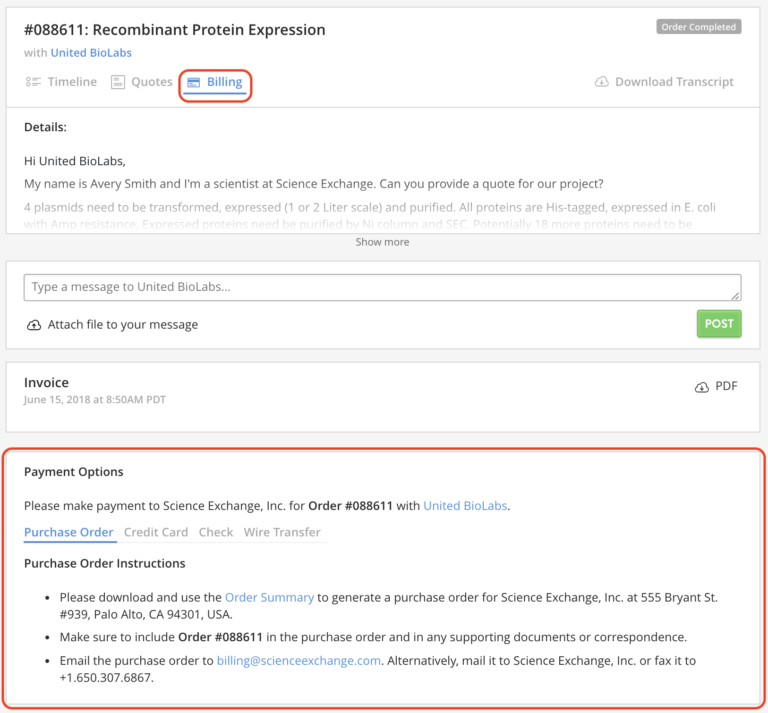 Once you’ve submitted your PO to Science Exchange, we will invoice against the PO once your payment is due. There is no further action required of you. If you need our W-9, or have any other billing inquiries, please contact [email protected] or call (855) 467-2439 ext. 703. Please have the 6-digit order number available so we can assist you as quickly as possible.